Whenever I am asked to list my favorite anime of all time, I unequivocally give the same answer: the Galaxy Express 999 movie. Released in 1979 and directed by Rintaro, I first watched it theatrically many, many years later, when I was about 16 years old. Galaxy Express 999 is instrumental in defining my artistic style, my desire to pursue anime and manga beyond what is at the forefront of fandom consciousness, and my general love of strong, emotional storytelling of the kind that cares less for intricate details and more for conveying the inner feelings of characters. Galaxy Express 999 was originally a manga by famed author Matsumoto Leiji, and was later adapted into a TV series, some movies, and multiple spin-offs. In almost every case, the basic setting is a future where intergalactic travel is possible through the use of high-tech spacecrafts designed to look like the trains of old. Of these, the most famous is the Galaxy Express 999, a mock steam engine which takes its passengers to the Andromeda Galaxy where they can obtain a mechanical body and live forever. One person who desires to board the 999 is a young vagabond of a boy named Hoshino Tetsurou, whose poverty prevents him from obtaining a train pass for the 999. A chance meeting with Maetel, a woman clad in all black with blonde tresses reaching down to her ankles, gives him the opportunity, but as he visits planet after planet he begins to realize that life and immortality are not so simple after all. Plot-wise, the 999 movie is no exception, though for the sake of time the story is greatly simplified. Instead of visiting dozens of planets, Tetsurou and Maetel visit fewer than ten. The result is that the voyage is not as long, and thus the theme of maturing from boyhood to manhood does not resonate quite as strongly, but in exchange the story is a little more focused, and a lot easier to digest; 2 hours is a lot less time than the 110 half-hour episodes which comprised the TV series. On an artistic level, the 999 movie is neck-deep in its 70s origins. This is no small part due to the original source material, but it extends far beyond being a cut-and-dry visual adaptation of the manga, adding many abstract, mildly psychedelic elements to scenes. For example, as the 999 travels along, the bright yellow windows along the sides of each rail car can be seen cutting through space, adding to the melancholy and wonder of the movie’s atmosphere. The acting is at its finest as well, with Nozawa Masako (Tetsurou) and Ikeda Masako (Maetel) giving some of their finest performances ever. Ikeda’s most famous role of all time is undoubtedly Maetel, and when you hear the subtle complexity and the aura of mystery in her voice, you will understand why. 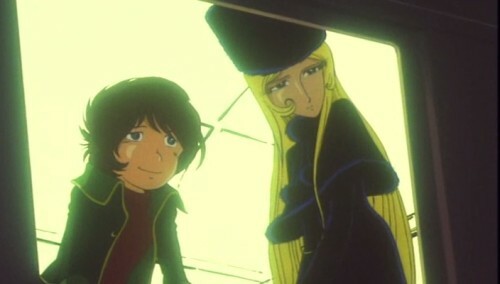 Along with a somewhat disparate yet sensible mix of orchestral scores and 70s pop and disco for a soundtrack, Galaxy Express 999 exudes a mostly romantic view of the future tinged by stark and poignant commentaries on the condition of life and humanity, commentaries that occur in the story itself as well as in the core aesthetics of the movie. Of course, the movie is not without its faults or peculiarities. Though designed to be a greatly shortened version of Galaxy Express 999, it still feels to some extent like a series of smaller stories strung together, creating a very loose sense of cohesion in the narrative. Also, while certain popular Matsumoto characters make cameo appearances, their presence may confuse some viewers unfamiliar with them. And for those who expect a movie about travel to feature some unexpected detours, this is not really the case with 999, which basically stays “on the rails”: an appropriate feature for a movie about an interstellar train to have, but perhaps one that would not be so popular among people hoping for a major derail. As I said at the beginning though, Galaxy Express 999 concerns itself less with weaving an intricate tapestry of a story and more with filling you with a mix of powerful emotions and human themes. I remember that, upon finishing this movie for the first time, I realized my jaw was wide open; that’s how much it amazed me and drew me into its world. Having watched the movie again recently, I became very aware of just how much I’d changed since I saw it, and as a result of having seen it all those years ago. Life, much like the titular train of the movie, is a one-way trip, and even if you revisit the old stops, you’ll realize that you’re not the same person you once were. This entry was posted in anime, galaxy express 999, philosophy, review and tagged influential anime, maetel, rintaro. Bookmark the permalink. I’ve been given endless incentive to get into the Leijiverse – maybe I’ll start with this movie. I just hope I can find it. Gisaburo Sugii, who’s also the director of the Street Fighter II animated movie. Galaxy Express 999 is one of those films that if you don’t ‘get’ it right away, you’re never going to ‘get’ it. I’m glad it had a positive effect on you at such a young age! But Rintaro, at his peak, did that. This movie MOVES, there’s such a flow to the direction. He doesn’t take as many chances as he did in the Space Pirate Captain Harlock (1970s) series, but there’s plenty of visual gold there for those that appreciate the art of filmmaking. Oh, technical thing: GE999 TV- 113 episodes, plus a number of ‘Toei manga festival’ featuretts and TV specials. Yeah, this movie is lovely, and is dated, but in a nice way. How about Adieu GE 999, though? I actually prefer the sequel to the first ijn terms of action and the dark tones in it. So this isn’t available anywhere, is it?